Alvis Edgar Owens, Jr (1929 – 2006) grew up in Sherman, Texas. One of the family pets was a donkey named Buck. Young Alvis liked the donkey so much he started calling himself Buck, and the nickname stuck. Buck’s formal education didn’t last long, as he and his family migrated west during the Dust Bowl years. He started singing as a young man and became extremely popular during a career that spanned well over fifty years. In that time, he recorded 39 studio albums and 97 singles, with 21 number one hits. 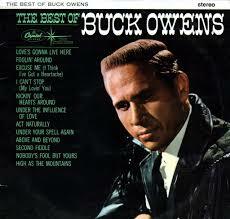 Owens’ The Best of… was released in 1963 and included twelve popular tracks and reached the number two slot on the Billboard Country Albums chart, and 45 on the Billboard Pop chart. More notable is its great success on the Norwegian record charts – it attained their coveted number one spot and retained it for a record-holding 222 weeks! This album is currently out of print, but all of the songs on it are available elsewhere, including “Love’s Gonna Live Here,” “Foolin’ Around,” and “Act Naturally” (the latter famously remade by the Beatles with Ringo Starr singing).